In my last blog, I shared highlights from our trip to Washington state. Another memorable moment happened during the Big Quilcene to Marmot Pass hike in Olympic National Forest. Well… almost to Marmot Pass. This hike reinforced a mantra I keep in mind while in the unpredictable great outdoors: plan that it might not go as planned. Through the years, this mantra has been helpful. We’ve arrived at our campsite only to realize we reserved it for the wrong day. We’ve turned back from summiting Great Basin National Park’s Wheeler Peak because the wind was literally knocking us down. And we’ve been stuck miles from a trailhead, pelted by rain and hail and dodging lightning bolts. 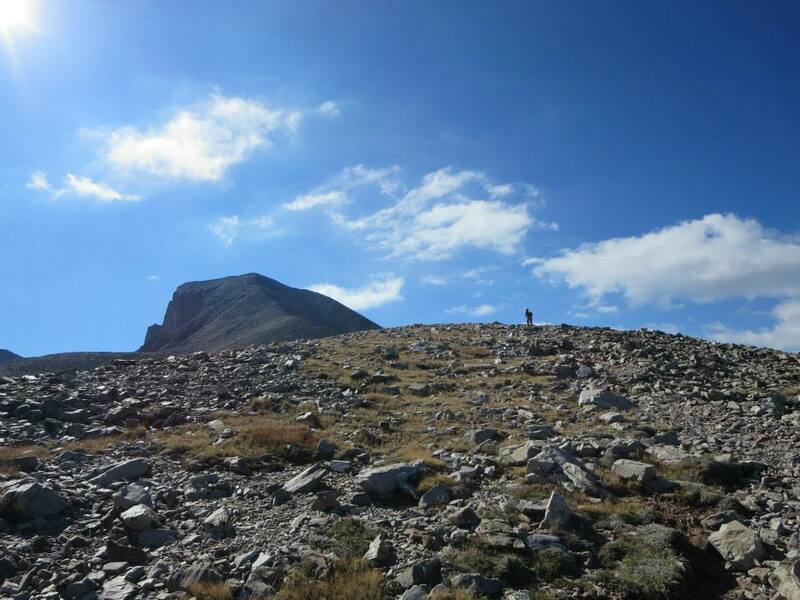 Flashbacks from 2013 in Wheeler Peak at Great Basin National Park. We were so close! But the wind kept knocking us down—literally. As my husband and I started up the trail in the beautiful old growth of the Buckhorn Wilderness, my biggest fear was not being able to hack the hike; my cardio training had been lacking. But as the Big Quilcene River rambled along parallel to the trail, it stoked my excitement for the sights to come and the peaceful night we’d spend in the backcountry. After huffing and puffing and gaining 1,150 feet in elevation, I was glad to arrive at Shelter Rock campground, where we set up our tent to lighten our packs. We continued on the trail, enjoying brilliant wildflowers, gurgling creek crossings, a grouse family, and the continuous unveiling of dramatic views. The view we enjoyed on the way to Marmot Pass. To those unfamiliar with the dangers of mountain goats, you might think, “Be careful? For what?” But it’s true—goats can cause fatal injuries when they charge. I don’t take this stuff lightly. Some people think, “it’ll never happen to me.” I’m the neurotic person who thinks, “it WILL DEFINITELY happen to me.” That’s why, when in bear country, I stock up on spray and practice drawing it from my holster. And it’s why—after reading Death in the Canyon—I constantly urged my fellow hikers to hydrate. As a result, we constantly had the urge to pee. Mountain goats crave something we manufacture: salt. Accustomed to people relieving themselves in the wild, many goats know that humans mean golden, mineral-packed goodness could be nearby. As we approached the final ascent to Marmot Pass, we spied the three goats high on a ridge. And they saw us. The high and mighty mountain goats. “Maybe they’ll leave by the time we get up there,” I said. Spoiler alert: they didn’t leave. As we rounded a switchback, two adults and a kid looked up from their task of munching on some greenery. “Let’s just ignore them. Try and go around them,” I said, and continued on, hungry for the summit. “Come on, Holly, we need to move,” my husband said. “Now.” We slowly backed away, then hightailed it away from the summit and back to our campsite, disappointed for not seeing Marmot Pass, but content we made the right decision. When we arrived at the car the next morning, we discovered that a mouse had been hiding in our rental and had gorged on nearly every food item we’d packed. Wildlife ate our lunch. But it didn’t get our pee. Holly Goat Gruff. At least we could laugh about it! P.S. – Going to mountain goat country? Check out these tips from the National Park Service. Share your too close to call animal encounters in the comments section!